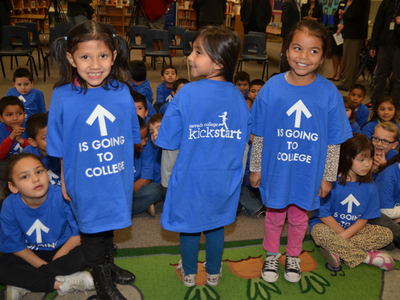 During a Feb. 20 event at Bracken Elementary School, Superintendent Pat Skorkowsky thanked the Nevada Treasurer’s Office “for ensuring the future of our children and making sure they have a choice when they graduate from high school.” Skorkowsky’s remarks followed State Treasurer Kate Marshall’s announcement that the state has launched the Nevada College Kick Start Program, which has established $50 college savings accounts for all Nevada 2013-2014 public school kindergarten students. CCSD Trustees Patrice Tew and Stavan Corbett attended the Bracken Elementary School event. Trustees Carolyn Edwards and Deanna Wright attended a similar event at Morrow Elementary School.